It is not very often that my own mother finds out about and purchases a resource related to my field of study before I do. However, this time it was personal. A family friend was featured in this book and I was unaware. Kate Winslet, who narrated the film, was inspired by Margret Ericsdottir and her son, Keli Thorsteinsson, to create the Golden Hat Foundation. The Golden Hat Foundation is a non-profit foundation titled after one of Keli Thornsteinsson's poems titled, "The Golden Hat", published in the book itself. This foundation's goal is to eliminate barriers for people with autism around the worlds and promote a positive environment where people with autism are seen as "intellectually capable". This includes helping people with autism communicate, receive an education, receive training for various jobs, and participate in community activities. To further promote the foundation and raise donations, the book The Golden Hat: Talking Back to Autism was created. Read my review of this book and find out how you can donate to the Golden Hat Foundation below. 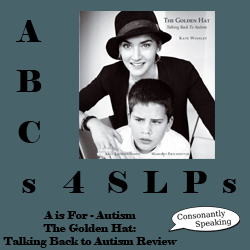 The Golden Hat: Talking Back to Autism begins with Keli Thorsteinsson's poem titled "The Golden Hat" and an image of the three authors (Kate, Margret, and Keli) together. This helps portray the mood of the book - hopeful, caring, and collaborative. Following the poem, two stories are shared - 1. Kate Winslet's story in narrating "A Mother's Courage: Talking Back to Autism", meeting Margret Ericsdottir and her son Keli Thorsteinsson, learning about autism spectrum disorders, and becoming an advocate for people with autism; 2. Margret Ericsdottir's experience as a mother of a person with autism as well as her journey to learn more about autism diagnosis/treatments, learning about her son, and creating a documentary as well as a foundation to help others who have autism spectrum disorders. After the stories and images from the film, documentation of e-mails sent back and forth between Kate and Margret are shown. These show the excitement, nervousness, learning, collaboration, and reality of the people and project for the creation of the Golden Hat Foundation. The bulk of the book is the images of celebrities and people with autism showing their support for autism research and communication for people who have autism. This is portrayed by each celebrity or person with autism taking a picture of himself or herself wearing the same hat, iconic of Keli's poem about how wearing a "golden hat" to speak for him until he lost it and could not communicate, that is, until he was taught how to use a letterboard. Each celebrity was also asked by Kate Winslet to state a quote that showed who he or she was and communicate that to the world as if it were the only words he or she could speak to go with the photo. Each person with autism was shown with his or her first words, spoken, written, typed, or spelled, along with his or her parents' reaction to his or her first words. These quotes were inspiring and gave an inside look into each individual, with or without autism. At the end of the book, more poems by Keli Thorsteinsson are published. These poems give an inside look into his mind and show that he is a creative, intelligent individual. Every purchase of the book, DVD, or merchandise will go towards the Golden Hat Foundation to benefit people who have autism. You can also donate to this organization on their website. The book, The Golden Hat: Talking Back to Autism, is available for purchase on Amazon.com or the Golden Hat Foundation's website. The DVD of "A Mother's Courage: Talking Back to Autism" is available on both Amazon and the foundation's website as well. I enjoyed the idea that Kate Winslet and Margret Ericsdottir came up with to photograph celebrities and people with autism wearing the hat while stating a quotation about themselves. I wish that there were more stories from the people who had autism in the book though. In addition, the e-mails were great to read to show the humanity, collaboration, advocacy, hard-work, and kindness of both Kate and Margret, but they took a while to read through. It was eye-opening to read the first-words of people with autism, especially my family friends' words of which I will never forget. Also, the poems by Keli Thorsteinsson were thoughtful, creative, and intelligent. I absolutely recommend that every speech-language pathologist read these parts of the book as well as Margret's story. I also enjoyed seeing the celebrities who supported the project. Being a film-lover myself, especially having started off reviewing movies online, it was great to see the humanity and personality of each celebrity. Most celebrities truly express themselves through humor or words that they would state if they only had one sentence to describe themselves; however, I feel that some of the celebrities missed the point of the task. Nevertheless, just being a part of this project is inspiring. The book is an easy, fast read (I read through it in 30 minutes to an hour), and enjoyable to flip through to read various quotes from people with autism and celebrities. I wish there were a little bit more information in the book but I do not feel that was the point. If you are looking for a brief look into the eyes or to read the words of a person with autism as well as the personalities of celebrities, this book is for you. In addition, as stated above, proceeds of the sales of this book will benefit the Golden Hat Foundation. To learn more about or donate to the Golden Hat Foundation, visit their website. To purchase the DVD, book, or merchandise to benefit the Golden Hat Foundation, visit their website as well. You can also follow the Golden Hat Foundation via Twitter, Facebook, and YouTube. From now on, every time that I am feeling lost in helping a child communicate, I will read the words of my family friend as well as others who have autism to remind me of how important communication is. Even if the path is hard, every step I take to help a child, with or without autism, communicate is absolutely beneficial and significant in his or her life. Communication is absolutely something that we take forgranted. I want to make sure that each child has a voice. This book review was not solicited by anyone, but the author inspired to write it due the courage of her family friend to include his story in the book. A special thanks goes out to Consonantly Speaking's mother for allowing her to borrow the book and sharing it with her. No form of compensation was received for this review.